Within Teamwork Projects, you can upload files directly to your projects for your team to collaborate on, view, download or start a conversation about in the comments. You can attach files to tasks, messages, and to comments on items. Files attached to any and all project items will be shown in the files area for you to find them easily. 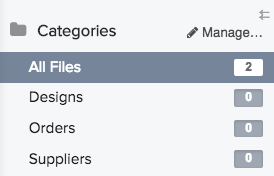 In the Files area, you will see a panel on the left with categories, which you use to organise your files. Each project can have its own individual set of categories. You also have the option to create category templates that will be used as the default when creating new projects. Below the categories, you will see a note of how much storage space you have used in this project and how much you have left overall for your site - it's shared between all of your projects. In the top right of the screen, you can upload new files, select multiple files, view the email address for posting files, and manage file categories. 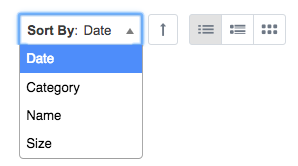 You can use the filters to choose which files to display, by keyword, user uploaded by, upload date, and tag. You also have options to hide uploaded files, hide third party files (from storage integrations) and show only locked files. Below the Upload Files button, you have sorting options, which give you the choice of sorting files by date, category, name or size. You can also switch between list, expanded and grid view. You may have multiple drafts of a file, so once a file has been uploaded you can add newer versions of the file by clicking the Versioning button. You will have the usual file options - set categories, notify by email and privacy options for the new version, as well as adding a description. Once the new version of the file has been uploaded, you will see the Versions button. Clicking this will show you all the versions you have uploaded for that particular file. 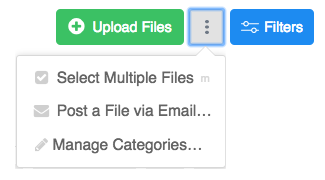 You can select files from Dropbox, Google Drive, One Drive and Box instead of uploading them directly to your project by clicking the button for that integration next to the Upload Files button, as long as you have that integration enabled at both site and project level. Browse to the file you want to add, select it and click Link-in Selected Files. 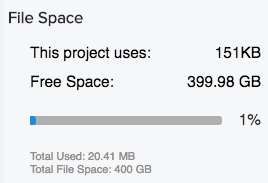 Files shared like this do not count against your file storage limits as part of your plan. Note: Files linked from third party integrations cannot be edited within Teamwork Projects. Depending on the file type, you may be able to view it within Teamwork Projects directly. Image files, PDFs and some spreadsheets and text documents are instantly viewable. Other file formats need to be downloaded to open them on your computer with the appropriate application. Look for the view or download options.